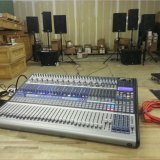 As the question states, How Do I know my StudioLive (Ai) is connected to my computer and functioning over firewire? NOTE: If you are Co-Installing Universal Control with UC AI drivers, please click this link here to understand how to do this correctly. Windows 8 = Tap the lower left hand corner of your desktop. In Metro, start typing "Device Manager." Select the "Settings" tab and select Device Manager from the list. Windows 8.1 = click the "Start" button at the lower left hand corner. Start typing "Device Manager." Select the application from the search box. Make sure when using a Windows 7 system, you always use the "Legacy" firewire card driver. Systems that have not been fully updated with Windows updates will cause a problem with connectivity. On the Mac platform, OSX will show any devices detected on the Firewire Bus in your System Profiler report. You can access System Proiler by going to Applications >> Utilities >> System Information, and any firewire devices seen by the computer will be listed under Hardware >> Firewire. you might need to Optimize your System using the knowledge base information provided on our knowledge base. If the above article does not solve this problem, please Contact Technical Support for further assistance. When the device driver is installed, you should see the device in the "Audio" portion of your System Information file, and Audio Midi Setup in your Utilities folder. If Universal Control-AI is not functioning correctly, you will need to take a look at the Uninstall Universal Control (AI) instructions here. NOTE: If you have installed Universal Control AI at any time on your system, it is suggested that you complete the UC AI uninstall instructions to remove all drivers. This is especially true for co-installation of drivers between Universal Control and Universal Control AI drivers. 2. Make sure if using a PC computer you are using an approved card that we have listed here on this knowledge base article and also use this information for assistance with proper interfacing. 4. (Classic StudioLive mixers) Make sure that your StudioLive mixer on the System Menu >> "Page 3: Digital" that your Firewire Link ID is set to "0" and not any number above that. This would cause your mixer to not show up on Universal Control on a Mac or PC computer. If the other devices connect properly with this firewire port/cable, then you will want to contact technical support for further assistance.